Operating Tip: Run or Search and Pounce? If you're considering putting in your first tower this spring or summer, it's definitely not too early to begin the project. As a large station investment, first steps include determining what your goals are, and having a good idea of the antennas you'll be putting up, since that determines tower ratings. Depending on where you live, Amateur Radio towers may be regulated by building codes, municipal codes, homeowner associations, or CC&Rs (Covenants, Conditions, and Restrictions). It's best to understand what you can and can't do before you start. Talk with other Amateurs in your local radio club, use radio club resources, the ARRL website and resources, and tower-specific mailing lists. Always verify information to make sure it's current and applicable to your situation. If you worked all 83 ARRL/RAC sections during the CW or Phone November Sweepstakes, and haven't ordered your Clean Sweep mug, you've got a few days left. The last day to order a 2016 November Sweepstakes mug is January 31. Mugs will be shipped in April 2017. The price for the keepsake mug is $15 each (including postage and handling) and orders should be sent to Clean Sweep Mugs, ARRL Contest Branch, 225 Main Street, Newington, CT 06111. Send a paper copy of the first page of your Cabrillo file and indicate how many mugs you are ordering along with your check. Participation pins are also available, see the Sweepstakes website for more information. The Southeastern VHF Society Conference, April 28-29, 2017 is soliciting your papers and presentations on "technical and operational aspects of VHF, UHF and Microwave weak signal Amateur Radio." Suggested areas of interest include contesting! "The deadline for the submission of papers and presentations is March 13, 2017. Papers and presentations are being handled by Jim Worsham, W4KXY. If you plan to submit a paper or presentation please contact Jim ASAP at w4kxy@bellsouth.net"
Jeff, WK6I, requests any anecdotes, stories, and pictures regarding the 2017 ARRL RTTY Roundup be sent to him via wk6i.jeff@gmail.com if you have not already posted them to 3830scores or submitted them with your log. NAQP Logs are now due five days after the contest. NAQP SSB logs from last weekend's contest are due on January 27. CQ 160 Meter Contest logs are also due five days after the contest. 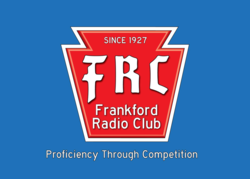 The Frankford Radio Club has been in operation since 1927! Dave, N3RD, and Bill, WY3A, reminded me that FRC is the Frankford Radio Club. Bill sent along the logo to prove it. Dave, K3ZJ, points out that "PVRC's contribution to WRTC 2018 is two tents in memory of all of PVRC's SKs, and one separate tent in memory of W3AU, W3GRF, & W4KFC." N8SS, K9YC, and N0AX all wrote in to discourage any non-standard or shortened exchanges. N7WA and K7WA both agree that the ARRL HF101 slide presentation referenced in the last issue was worked on by N0AX and K7WA. Don, AE5K, points out that the BITX40's VFO chip is the Phase Locked Loop SiS5351. A number of readers wanted to know which contests applied the N-QSO rule in the adjudication of contests. It's up to the sponsors to determine when it's appropriate to apply scoring criteria in addition to those published in the rules. This has occurred when there was cause to believe that some competitors were not provided accurate contact information by the stations that they worked, such as during WRTC 2006. Pre-flight checking of logs by applying the N-QSO rule can also identify logs that are different than their cohort and may require extra attention when scored using the contest rules. In WRTC 2014, final top scores and standings were affected by the inability to verify during the judging timeframe that a multiplier only worked by a single top team was valid. Team Competition - The maximum team size is now five members to encourage activity and allow small teams to be competitive. Multipliers - The list of multipliers is now congruent with that of the NAQP. The next CW Sprint is scheduled for February 5, 2017. These NCJ Sprint rule changes do NOT apply to the Phone Sprint, which is sponsored by a different entity. Electronics industry analysts are predicting that 3.5mm headphone jacks will increasingly be disappearing from high-end cellular phones and other consumer electronics over the next year. The trend, which started to be mainstream with the Apple iPhone 7, is accelerating. Many devices already have Bluetooth wireless circuitry, and eliminating the 3.5mm jack cuts production costs and a potential source of a mechanical problem. Removing the hole in the case makes it easier to fluid-proof devices as well. With the retail prices of Bluetooth audio modules in the sub $10 range, we'll likely be seeing wireless audio capability built into our ham gear. Suitable audio latency is a headset characterstic to verify before using any CW application. Jim, K8ARY, enjoys entering the ARRL RTTY Roundup because of his experience with mechanical teletype machines: "I was a teletype mechanic in a previous life. Now I just tinker with the beasts and get on the air with a machine when possible. There has been some discussion on Greenkeys (an electronic mailing list dedicated to mechanical TTYs - Ed.) about having a 'machine' category during a RTTY event. QSOs take a bit longer to complete as there is no automated exchange. I am wonder if this is something that might be of interest to other RTTY contesters? The Greenkeys participants are interested in some type of acknowledgment for the TTY machines. As a group, we are trying to extend the longevity of the machines that still exist." Donations to WRTC 2018 will be matched dollar for dollar by the Yankee Clipper Contest Club Matching Gift program, but only until February 28, 2017. Up to $500 will be matched. See this article for details. Five states may have "right to repair" laws on their books later this year, which would compel manufacturers to make information and parts available for the repair of consumer products. Bills in Nebraska, Minnesota, New York, and Massachusetts have already been introduced. Kansas will likely be next. Wyoming is considering a right to repair law restricted to agricultural equipment, as farmers are finding that they are unable to repair the equipment they depend on for their livelihood. Cans: headphones. It is said it originated from British slang, potentially among BBC employees. Steve, N2IC, reports that the NAQP CW Score Database has been updated to include the August 2016 CW NAQP results. WRTC 2018 announces that the first Sponsored WRTC 2018 Team will be led by Rick, N6XI. Rick has been entering radio contests for over fifty years, and was a WRTC competitor in 2010. Additional sponsored team opportunities are available, see the WRTC 2018 website for more information. Run, or Search and Pounce? In general, it really is all about the rate, making the most number of points per minute. Logging programs can provide information to help make decisions on how to operate moment to moment, but you also have to know the scoring rules. For example, if you've made 400 contacts worth 2 points each so far, and have 27 multipliers, you'll have 21600 points. Here's one way to predict your next hour: Assume conditions stay the same. If your logging program is telling you that your hourly rate is 60, and the band doesn't change, and the mix of multipliers remains the same at about 4 per hour, you might expect to add 7520 points to your score, or about 125 points per minute during the next hour. At the time of prediction, one multiplier is worth 800 points, or about 6.4 minutes of rate. If you can find and work more than one multiplier every 6 minutes, you should consider S&P. Otherwise, run. The catch is that there are other variables, and conditions do change. There may not be enough multipliers available to support working one every 6 minutes. A higher rate may be available on this band or another band. Multipliers may be available now that won't be available later. The reasonable strategy? Know what you and your station are capable of to inform your decisions. Run on one VFO, find multipliers on the other. Only work multiplier stations on that second VFO until you're assured that there are no multipliers to work. Evaluate what you are doing at frequent intervals. Joe, K8JP, suggests using 20 lb paper instead of dollar bills to clean a contact, as dollar bills can be dirty. "I have strips of paper cut for this. I keep a small bottle of alcohol on my desk to dip the strips of paper into for stubborn dirt pieces." The fourth edition of the "Agilent Impedance Measurement Handbook" is available, and it provides guidance on how to make accurate measurements under various conditions. As automated measurements become more the norm, the handbook also points out how to recognize and avoid inaccurate measurement results. The Boy's Life website recently featured a how-to article on building a crystal radio. The design uses a wound coil and germanium diode driving a telephone handset. The telephone handset may be the most difficult component to find. Ward, N0AX, rediscovered this lament while reading "The History of the ARRL": "In March, 1916...Almost the entire interest of amateur radio of this period seems to have been in the development and improvement of operating practices and technique. Technical interest had fallen largely by the wayside, insofar as the typical amateur was concerned. There we routine arguments about the relative efficacy of high and low spark tones, and some discussion about the proper circuits and operating voltages to be used with audions, but the pervading spirit was one of complete complacency with regard to the technical status of the art." Not much has changed since then, eh, OM? When good coax goes bad, it's often due to water ingress. DX Engineering has published a technical tip showing how to use a combination of rubber splicing tape and vinyl tape to make weatherproof coax connectors. The Flexradio folks have shared an application note regarding grounding in the shack. Single point grounding and the differences between RF and electrical grounding are among some of the topics discussed. Try this one simple trick to improve your station and your contest scores over time: Invite someone else over to operate your station for an entire contest. Even if you don't have time to tidy up the shack to make your operating position less distracting and more efficient for yourself, chances are you'll likely do that for a guest. By having to explaining your station layout, band change procedures, rotator and rig controls, chances are you'll think of a way to streamline things. If all of that goes well, here's something that could be really difficult: Invite constructive feedback from your guest(s) on what they think can be improved. Improvements that benefit your guests will also help you attain higher scores. And isn't that what it's about? CWops Mini-CWT Test, Jan 25, 1300z to Jan 25, 1400z, Jan 25, 1900z to Jan 25, 2000z, Jan 26, 0300z to Jan 26, 0400z; CW; Bands: 160, 80, 40, 20, 15, 10m; Member: Name + Member No., non-Member: Name + (state/province/country); Logs due: January 28. NCCC RTTY Sprint, Jan 27, 0145z to Jan 27, 0215z; RTTY; Bands: (see rules); Serial No. + Name + QTH; Logs due: January 29. QRP Fox Hunt, Jan 27, 0200z to Jan 27, 0330z; CW; Bands: 80m Only; RST + (state/province/country) + name + power output; Logs due: February 2. NCCC Sprint Ladder, Jan 27, 0230z to Jan 27, 0300z; CW; Bands: 160, 80, 40, 20, 15, 10, 6m; Serial No. + Name + QTH; Logs due: January 29. CQ 160-Meter Contest, CW, Jan 27, 2200z to Jan 29, 2200z; CW; Bands: 160m Only; W/VE: RST + (state/province), DX: RST + CQ Zone; Logs due: February 3. Montana QSO Party, Jan 28, 0000z to Jan 29, 0000z; CW, Phone, Digital; Bands: 160 to 70cm; MT: RS(T) + county, non-MT: RS(T) + (state/province/"DX"); Logs due: February 4. REF Contest, CW, Jan 28, 0600z to Jan 29, 1800z; CW; Bands: 80, 40, 20, 15, 10m; French: RST + Department/Prefix, non-French: RST + Serial No. ; Logs due: February 13. BARTG RTTY Sprint, Jan 28, 1200z to Jan 29, 1200z; RTTY; Bands: 80, 40, 20, 15, 10m; Serial No. (no signal report); Logs due: February 5. UBA DX Contest, SSB, Jan 28, 1300z to Jan 29, 1300z; SSB; Bands: 80, 40, 20, 15, 10m; ON: RST + Serial No. + province, non-ON: RST + Serial No. ; Logs due: February 12. Winter Field Day, Jan 28, 1900z to Jan 29, 1900z; Any; Bands: All, except WARC; Category + ARRL Section (or DX); Logs due: March 1. QRP Fox Hunt, Feb 1, 0200z to Feb 1, 0330z; CW; Bands: 80m Only; RST + (state/province/country) + name + power output; Logs due: January 26. Phone Fray, Feb 1, 0230z to Feb 1, 0300z; SSB; Bands: 160, 80, 40, 20, 15m; NA: Name + (state/province/country), non-NA: Name; Logs due: January 27. CWops Mini-CWT Test, Feb 1, 1300z to Feb 1, 1400z, Feb 1, 1900z to Feb 1, 2000z, Feb 2, 0300z to Feb 2, 0400z; CW; Bands: 160, 80, 40, 20, 15, 10m; Member: Name + Member No., non-Member: Name + (state/province/country); Logs due: January 28. UKEICC 80m Contest, Feb 1, 2000z to Feb 1, 2100z; CW; Bands: 80m Only; 4-Character grid square; Logs due: January 25. NRAU 10m Activity Contest, Feb 2, 1800z to Feb 2, 1900z (CW), Feb 2, 1900z to Feb 2, 2000z (SSB), Feb 2, 2000z to Feb 2, 2100z (FM), Feb 2, 2100z to Feb 2, 2200z (Dig); CW, SSB, FM, Digital; Bands: 10m Only; RS(T) + 6-character grid square; Logs due: February 16. NCCC RTTY Sprint, Feb 3, 0145z to Feb 3, 0215z; RTTY; Bands: (see rules); Serial No. + Name + QTH; Logs due: January 29. QRP Fox Hunt, Feb 3, 0200z to Feb 3, 0330z; CW; Bands: 80m Only; RST + (state/province/country) + name + power output; Logs due: January 26. NCCC Sprint Ladder, Feb 3, 0230z to Feb 3, 0300z; CW; Bands: 160, 80, 40, 20, 15, 10, 6m; Serial No. + Name + QTH; Logs due: January 29. YLRL YL-OM Contest, Feb 3, 1400z to Feb 5, 0200z; CW/Digital, SSB; Bands: All; QSO No. + RS(T) + (section/province/country); Logs due: March 5. Vermont QSO Party, Feb 4, 0000z to Feb 6, 0000z; All; Bands: 160, 80, 40, 20, 15, 10, VHF/UHF; VT: RS(T) + County, non-VT W/VE: RS(T) + (state/province), DX: RS(T); Logs due: March 5. Triathlon DX Contest, Feb 4, 0000z to Feb 4, 0759z (CW), Feb 4, 0800z to Feb 4, 1559z (SSB), Feb 4, 1600z to Feb 4, 2359z (RTTY); CW, SSB, RTTY; Bands: 80, 40, 20, 15, 10m; RS(T) + Serial No. ; Logs due: February 28. 10-10 Int. 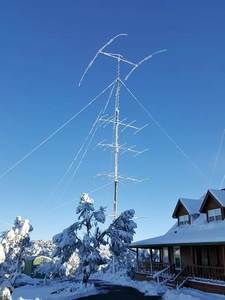 Winter Contest, SSB, Feb 4, 0001z to Feb 5, 2359z; Phone; Bands: 10m Only; 10-10 Member: Name + 10-10 number + (state/province/country), Non-Member: Name + 0 + (state/province/country); Logs due: February 20. F9AA Cup, CW, Feb 4, 1200z to Feb 5, 1200z; CW; Bands: 80, 40, 20, 15, 10, 2m; RST + Serial No. ; Logs due: March 6. Black Sea Cup International, Feb 4, 1200z to Feb 5, 1159z; CW, SSB; Bands: 160, 80, 40, 20, 15, 10m; HQ: RS(T) + club/org abbreviation, Black Sea Countries: RS(T) + ITU Zone No., BSCC Members: RS(T) + "BS" + club number, Others: RS(T) + ITU Zone No. ; Logs due: February 15. FYBO Winter QRP Sprint, Feb 4, 1400z to Feb 5, 0000z; CW, SSB, Digital; Bands: 160, 80, 40, 20, 15, 10m; RS(T) + (state/province/country)+ name + power out + temperature(F); Logs due: March 5. Minnesota QSO Party, Feb 4, 1400z to Feb 5, 0000z; CW (CW/RTTY/PSK), Phone (FM/SSB); Bands: 160, 80, 40, 20, 15, 10m; MN: Name + County, W/VE: Name + (state/province), DX: Name; Logs due: March 15. British Columbia QSO Party, Feb 4, 1600z to Feb 5, 0400z; CW, SSB, Digital; Bands: 160, 80, 40, 20, 15, 10m; BC: RS(T) + District, non-BC: RS(T) + (state/province/"DX"); Logs due: March 7. AGCW Straight Key Party, Feb 4, 1600z to Feb 4, 1900z; CW; Bands: 40m Only; AGCW: RST + Serial No. + "/" + Class + "/" + Name + "/" + Age; Logs due: February 28. FISTS Winter Slow Speed Sprint, Feb 4, 1700z to Feb 4, 2100z; CW; Bands: 80, 40, 20, 15, 10m; FISTS: RST + (state/province/country) + first name + FISTS No., non-FISTS: RST + (state/province/country) + first name + power; Logs due: March 5. Mexico RTTY International Contest, Feb 4, 1800z to Feb 5, 1759z; RTTY Only; Bands: 80, 40, 20, 15, 10m; XE: RST + State, non-XE: RST + Serial No. ; Logs due: March 8. North American Sprint, CW, Feb 5, 0000z to Feb 5, 0400z; CW; Bands: 80, 40, 20m; [other station's call] + [your call] + [serial no.] + [your name] + [your state/province/country]; Logs due: February 10. RSGB 80m Club Championship, SSB, Feb 6, 2000z to Feb 6, 2130z; SSB; Bands: 80m Only; RS + Serial No. ; Logs due: February 13. ARS Spartan Sprint, Feb 7, 0200z to Feb 7, 0400z; CW; Bands: 80, 40, 20, 15, 10m; RST + (state/province/country) + Power; Logs due: February 9. QRP Fox Hunt, Feb 8, 0200z to Feb 8, 0330z; CW; Bands: 80m Only; RST + (state/province/country) + name + power output; Logs due: January 26. Phone Fray, Feb 8, 0230z to Feb 8, 0300z; SSB; Bands: 160, 80, 40, 20, 15m; NA: Name + (state/province/country), non-NA: Name; Logs due: January 27. CWops Mini-CWT Test, Feb 8, 1300z to Feb 8, 1400z, Feb 8, 1900z to Feb 8, 2000z, Feb 9, 0300z to Feb 9, 0400z; CW; Bands: 160, 80, 40, 20, 15, 10m; Member: Name + Member No., non-Member: Name + (state/province/country); Logs due: January 28. See NCCC Sprint Ladder, Vermont QSO Party above.